There are plenty of gliders and ottoman sets at amazon to choose from. There is also a price difference between the different items. Many parents to be are facing the same question, should we buy a cheap glider chair or invest in an upholstered glider? Wooden glider vs upholstered glider? The 10 best selling gliders at Amazon are wooden gliders. The best selling glider is Stork Craft wooden glider which costs only $130 (see pic on right) It might be tempting to buy a glider set and ottoman at $130, because the price is cheap and has good customer reviews. After ten wooden cheap gliders, the no’ 11 best selling item is an upholstered glider chair called: Harmony Kids Round Back Glider (see pic below). In this post we will review some of the differences between a cheap glider sets and a luxurious upholstered glider chairs like the Harmony Kids Round Back Glider. How much money do you have to invest in your nursery room? If you have a tight budget, than you should buy a baby crib a changing table and if you have money left, buy a wooden glider chair which is rather cheap compared to full furniture gliders. If you have enough budget to furnish the baby nursery room, than investing in a comfortable glider is very worthwhile. 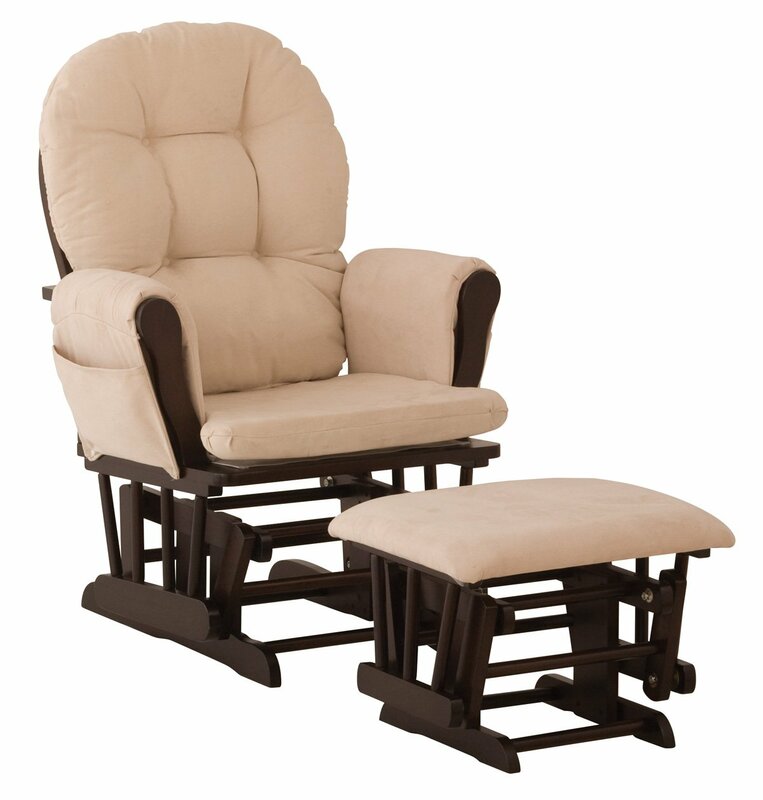 The upholstered gliders are more cozy and comfortable for the parents than the wooden gliders. The cushioning are better layered, and the cover can be washed separately. How big is the nursery room? If you have a large nursery room for the baby, than investing in an upholstered glider chair is a wise investment. These are luxurious wide and beautiful, they will be the little private area for parents and child bonding. Investing in a long term furniture. Though the Stork Craft glider costs only $130, many of the reviews say it begins to creek and squeak. The wooden joints are not smooth forever, and the glider has a hard time to carry overweight parents (and most pregnant mothers have extra pounds for a few month). People who are used to buying fine furniture know the things which are cheap will not last for long, and investing some more on an item is wise for the long term. An upholstered glider chair will not squeak within a few month and can glider and swivel for years. The luxurious design makes it a furniture which can be placed in front of the TV as a sofa. If you do not have the spare cash, than you have less choices. The Stork Craft Hoop Glider is the best glider you can buy (and the ottoman is included). If you have enough funds for proper planning an upholstered glider chair will last longer and will be more comfortable to use and nurse the baby. Unlike other baby furniture sets the glider is not for the baby – it is for you! Invest in a furniture in which you will be sitting for hours upon hours in the next few years. This entry was posted in Gliders & Ottomans and tagged cheap glider and ottoman set, Harmony Kids Glider, Upholstered Glider & Ottoman Set by dekel. Bookmark the permalink. Next → Next post: Baby Furniture? How Much Are Your Child’s Fingers Worth?